Washington, DC—Today, Congressman Doc Hastings (R-WA) held a hearing in the House Natural Resources Committee on the Endangered Species Act (ESA) and its impact on jobs and the economy. The ESA is critical for protecting wild, endangered salmon and steelhead in the Columbia and Snake Rivers in the Pacific Northwest. Those protected salmon in turn are responsible for thousands of jobs across the region, from Alaska to California, and across numerous industries. Some of the affected industries include commercial and sport fishing, recreation and tourism, restaurants, and the growing renewable energy sector. “Suggesting that the ESA is at odds with economic vitality is simply a false proposition. When it comes to wild salmon, protecting and implementing the Endangered Species Act is about more than saving fish; it's about saving jobs and livelihoods in our communities as well as. Literally thousands of businesses and tens of thousands of jobs are supported by salmon and steelhead in the West,” said Joel Kawahara, a commercial salmon fisherman from Quilcene, WA. A Washington Trollers Association board member, Kawahara joined 20 other Northwest business leaders in sending a letter to Congressman Hastings todayin support of the ESA, jobs, and salmon. Federal agencies’ failure to comply fully with the ESA on the Columbia and Snake River hydro-system limits opportunities for the commercial, recreational, and tribal fishing economy, and the manufacturers and retailers of outdoor equipment - affecting river and coastal communities across the West. In addition, the government’s failure to comply with the law and protect salmon and steelhead in the Columbia-Snake hydro-system is standing in the way of new opportunities to create jobs for renewable energy sources like wind. “The benefits of the ESA for our region’s economy and its ecology are all the more reason to take a new approach to salmon restoration in the Pacific Northwest. We need a stakeholder process where various interests can come together to build a solution for the future,” continued Kawahara. Fifty-two members of Congress (both Republicans and Democrats), Senators Merkley (D-OR), Crapo (R-ID) and Risch (R-ID), Governor Kitzhaber of Oregon, nearly 1,200 American businesses, and seven of the nation’s largest conservation organizations all support a comprehensive “solutions table” to resolve the issues facing NW salmon. Also at today’s hearing, both Congressman Hastings and NOAA Fisheries Administrator Eric Schwaab claimed that Columbia-Snake Basin salmon are faring well based on recent returns of adult fish. But these assertions don’t square with NOAA Fisheries’ own science: in its 2010 salmon plan for the Columbia and Snake Rivers, NOAA concluded that the overwhelming majority of salmon populations in the Basin are experiencing declines in productivity and are now facing increased risk of extinction. 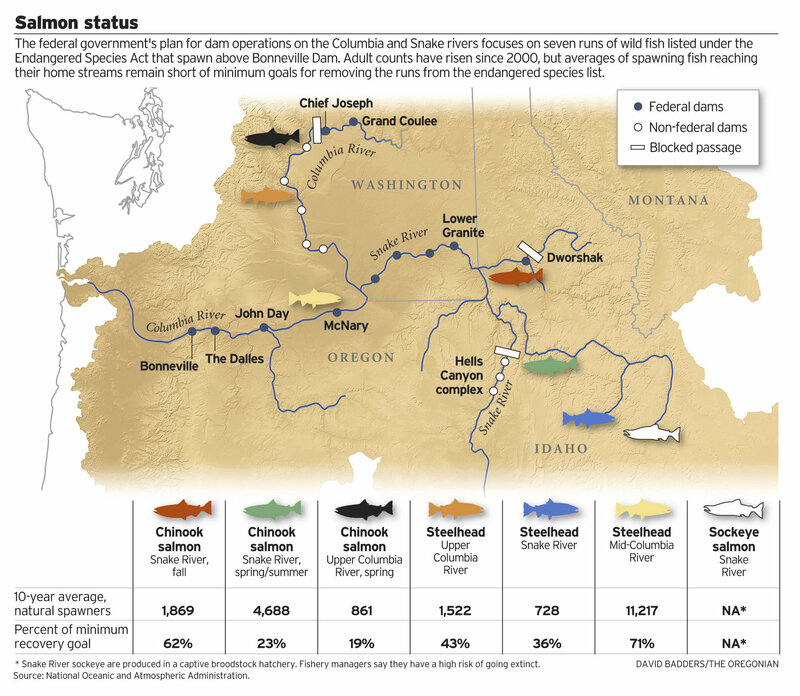 Take a look at a map from the Oregonian outlining NOAA's failure to reach recovery targets for salmon. “Masking the facts with wishful thinking won’t get us any closer to salmon recovery in the Columbia and Snake Rivers. This kind of head-in-the-sand approach puts real jobs in jeopardy. Instead, we need to acknowledge the scope of the problem – salmon are in serious trouble – and work together to find effective, common-sense, and science-based solutions,” said Nicole Cordan, policy and legal director for the Save Our wild Salmon coalition.